"The only ones who are crazy enough to think they can change the world are the ones who do." Please go to the Global Emergency Alert Response Network Homepage for 2014 Rainbow Uprising Campaign USA National Tour Schedule that includes this 20th Anniversary Event. Bring your Drums if you can join us camping at Big Lake Arizona for our 20th Anniversary remembrance of the August 20-28, 1994, "World Unity Festival, Conference and Drums Around the World", event organized over the preceding three years as a Mutual Prophecy Fulfillment event, encamped near the Grand Canyon after some days camping at Big Mountain Arizona, initiated per Mayan Calendar date of August 28th that year, with the intent "to fulfill prophecy". Then by "coincidence" on August 20th the first White Buffalo Calf was born, named "Miracle", fulfilling the Lakota Prophecy from 19 generations ago as a Sign of Hope for the people in these difficult times predicted back then. August 28th Closing Ceremony Noon, honoring the amazing Sacred Pipe Ceremony on the same date in 1994 (Event story featured on the cover of High Times Magazine) conducted by Chief Phil Lane Jr around the Rainbow Peace Pole for The White House after introduction Aug.27 of the Rainbow Uprising Peace Pole for Jerusalem. Six months before that August 28th date, the event organizer found out that the Urantia book followers believe that date is the actual birthday anniversary of Jesus Christ. A Global Rainbow Uprising Spiritual Unity Gathering and Celebration"
There has been a problem with the online reservations system from that CampArizona site, but you can still see the layout and views online while you can book reservations paying over the phone via this number: 877-444-6777, or through http://recreation.gov but that site is kind of funky. Otherwise below are listed three other campgrounds nearby (Rainbow, Cutthroat, Brook Char) for up to 8 people in each campsite at any of these campgrounds with water and toilets etc, half price if you pay $80 for Inter-agency pass, ie, $10 per day instead of $20/day. This means for 8 people with one signing up to buy the campsite from one of the below links, it would total $200 for the 12 days Aug.18-30, or $25 each for the week, about $2/day per person. Those who can be hosts by buying the campsites can go to the 2014-Unity-Gathering Yahoogroup below and look for people to host and contact them off that list to make arrangements to share expenses. Paid campsite holders can help support any overflow campers with respite locations and celebrations in their camps, by their invitation at daily presence at Main Meadow of monitor volunteers. Once we have filled all those campsites we will have the leverage to create a nearby overflow camp on empty land, either rainbow gathering style, or by virtue of Indigenous Sovereignty if Indigenous Spiritual Leaders come in sufficient presence to effect this result by their spiritual authority. There is no reliable cellphone signal at these campgrounds or pretty much around the whole Big Lake with some exceptions, according to the Big Lake Bait and Tackle Shop where meager supplies are available. The nearest supply stores of significance and places with WiFi access are 26 miles away in Eagar AZ. Please come self-sufficient as there is not yet any commitment for a community free kitchen. If that changes I will post that information here. Yes, we are the only store within 20 miles of Big Lake. We are also on the edge of all cell service. Verizon works the best, but is really spotty. There are small areas around the lake that you can get both Verizon and AT&T, but I can almost guarantee you will not get either one right at your campsite. If you need to access wifi your best bet is to drive down to Eagar (26 miles) where they have a few restaurants and library with wifi access. Our store has a little bit of everything. Grocery's, tackle, licenses, gas, ice, boat rentals, and food items that can easily be heated like hamburgers, sandwiches, and burrito's. We look forward to having you and your friends soon. I hope this helps answer some of your questions. See you soon and drive safe. I will be posting updates perhaps more quickly to the Rainbow-Uprising and the new 2014-Unity-Gathering Yahoogroups and in more details than I may have time to add here. Please join this new 2014-Unity-Gathering Yahoo group if you want to host guest world spiritual leaders at your paid campsite reserved as above, or just to keep up with the latest arrangements and schedule of daily activities I will be promoting and offering. You can post an email to this group with how many spaces and what site you have booked listed in your subject line, or you can watch for emails from the group with names and info about guests in the subject line who need such support and you can contact them directly from information in those emails. As a calendar of events during the days of the gathering develops those can be posted also to that group calendar, eg, workshops, ceremonies, celebrations at various camps etc. Go to this URL to join the public group or to see all the archived messages as they are posted. Overflow camping nearby to be announced, facilitated by serious and sober believers in the one world family ethics and creed of the Rainbow Family of Living Light -- who "saved our bacon" by establishing and hosting the camp in 1994 under the guidance of Felipe Chavez of the Kid Village Kitchen -- who host and conduct the annual Rainbow Family Gatherings of The Tribes from July 1-7 each year without permits and without leaders in the national forests across America. HOWEVER, This Unity Gathering Reunion Site Event is being convened in respect of the indigenous peoples' spiritual leadership traditions where individuals do take very personal responsibility for assumed leadership roles. It is NOT a "rainbow gathering" where anything goes and no leadership is respected, so if you cannot abide this way of living, please do not come to this gathering. Geoff Dreyer is the one with the inspiration for the vision of convening such a 20th anniversary gathering in respect of the “World Unity Festival and Drums Around the World” event that took place from August 20-28, 1994, see background news article (*), when he assisted the main organizer then, Michael DiMartino who made a real mess of things with his defaulting on many financial commitments that he had made in order to manifest his vision of a gathering to fulfill the Hopi request for a gathering of world spiritual leaders to compare knowledge and pray together for the fulfillment of Hopi Prophecy relating to changing the course of history off of the pathway towards total destruction and onto the pathway towards our inevitable future of peace and harmony and prosperity for all life on Earth, as depicted in the central chapter in the 1962 book called “Warriors of The Rainbow” by Vinson Brown and William Willoya, published by Naturegraph. “This is the Arab Spring of the spiritual movement,” said Geoffrey Ocean Dreyer, a 52-year-old U.S. musician wearing a sombrero and mardi gras beads. --– quotes from an English language News article (*) from Vietnam about the 2012 Mexico Mayan Calendar event. I was at first just trying to help Geoff with this webpage to assist him with some outreach because he was traveling promoting the event and scouting the site after discussing this unity gathering reunion with those he could reach at this year’s Rainbow Family Gathering in Utah, July 1-7, 2014. Because he made such a mess of things, the state of Arizona has banned DiMartino from doing any such events again in future in that state, and yet he had a repeat performance in Mexico during the time of the Mayan calendar change in December 2012, again defaulting on financial agreements and making people mad at him and hesitating to participate in anything with his history attached to it. But Geoff insists that Michael will not be coming to this 20th anniversary reunion event, and certainly is having nothing to do with organizing/convening this free and open Spiritual Unity Gathering 2014 to further the cause of “Global Peace Now!” for All Our Relations. Geoff started a Facebook page (*) to help rally the right people to come and help host and support this year’s “Spiritual Unity Gathering and Celebration of Peace and Love Among All Our Relations as Our Family of Life". HOWEVER, as of July 23, 2014, Geoff took the decision against supporting the Rainbow Uprising Campaign theme and decided because Big Lake is too far from Flagstaff to coordinate from that Facebook page a concurrent remembrance gathering event at another location closer to Flagstaff to be announced at that Facebook page, a place with no water and out in the woods. 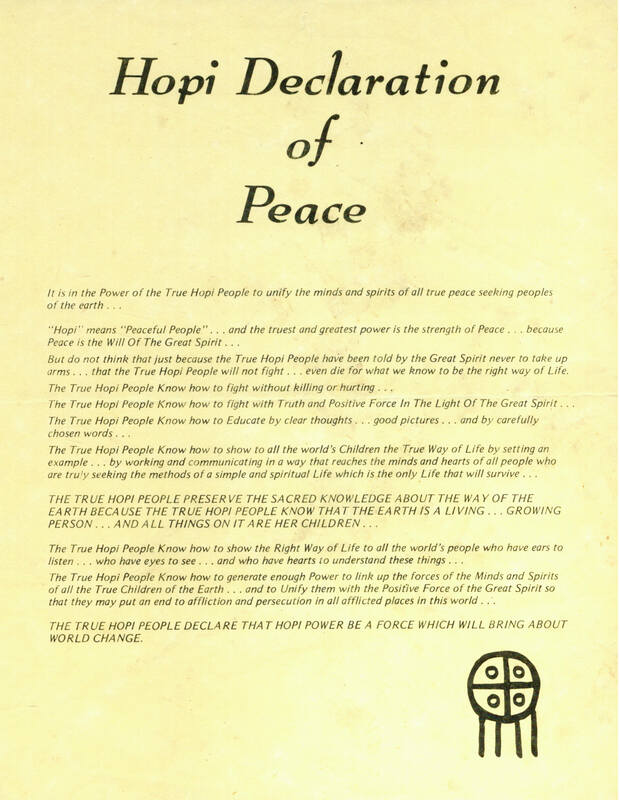 But he said he would rally the right people from that gathering to join us at the park in Flagstaff on July 31st Sunday all day peace prayer vigil before the 5 day Rainbow Uprising Peace March to the Hopi Cultural Center starts on Monday Sept.1. 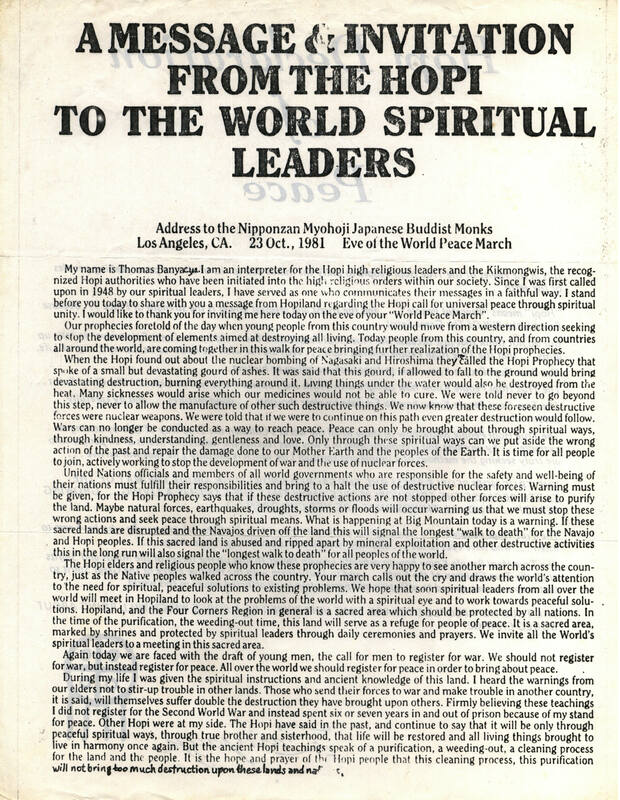 Message and Invitation from The Hopi to The World Spiritual Leaders (**). I have posted a significant amount of important background information items to that Facebook page, added as Comments to his posts there over the last couple months, since he is the only one allowed to post to its “wall”, some bits of which I am re-posting here as background and will add more from time to time in the next couple weeks. World Unity Festival 20th Anniversary Mutual Prophecy Fulfillment Gathering August 20-28, 2014, 26 miles south of Eagar AZ, 9,000 feet elevation, ceremonies and celebrations, background is in this Article (*) about the birth of the first white buffalo calf in fulfillment of Lakota prophecy on August 20, 1994, the day Felipe Chavez and crew moved onto the land site in 1994 near the Grand Canyon to set up the gathering site while hundreds of us gathered at Big Mountain to council with their elders while waiting for the site to be established near the Grand Canyon where we moved to shortly after August 20th for the Drums Around the World jam, and the main day ceremony August 28, 1994, which was planned for 3 years to coincide with a prophecy fulfillment date on the Mayan Calendar, and about six months before then it was learned that the Urantia book people believe August 28th to be the actual birthday anniversary of Jesus Christ. Fantuzzi was the MC during the visits to the camps at the gathering 20 years ago, walking the Rainbow Peace Pole for Jerusalem to the main circle the day before the main August 28th amazing pipe ceremony by Chief Phil Lane Jr, with many hundreds of people gathered encircling the Rainbow Uprising Peace Pole for the White House created at the end of the Long Walk for Survival in 1980 in Greenbelt Park Maryland. When that Jerusalem Peace Pole was introduced August 27th at the last stop of the peace walk before depositing it at the main ceremony circle, in the big tent put up by some radical Christians from Flagstaff, at the moment Fantuzzi spoke the name of Jesus Christ there was instantaneous loud thunder and lightning at the same moment. Fantuzzi said to Geoffrey Cline Dreyer at the Utah Rainbow Family 2014 annual gathering that he would be at this 20th anniversary reunion of the original gathering. There is a photograph of Jesus Christ that I found in a book in India in 1996, posted here with the story (*) of how that came about. I am creating this web page to put out some information about that history and this coming gathering designed to build momentum to take the Peace Pole for Jerusalem to Jerusalem for a Rainbow Uprising Peace Walk from Bethlehem to Jerusalem this Christmas after associated outreach and prayers help manifest peace over there as soon as possible, keep looking here for updates, where today’s latest (July 14, 2014) Rainbow Uprising Campaign schedule with Announcement is posted here (*). Please see very important related “solution for peace” information in my Comments (*) to a post in the shared Facebook thread today about solving the Israeli Palestinian crisis, where you can add your comments and share the thread, updated July 14th. 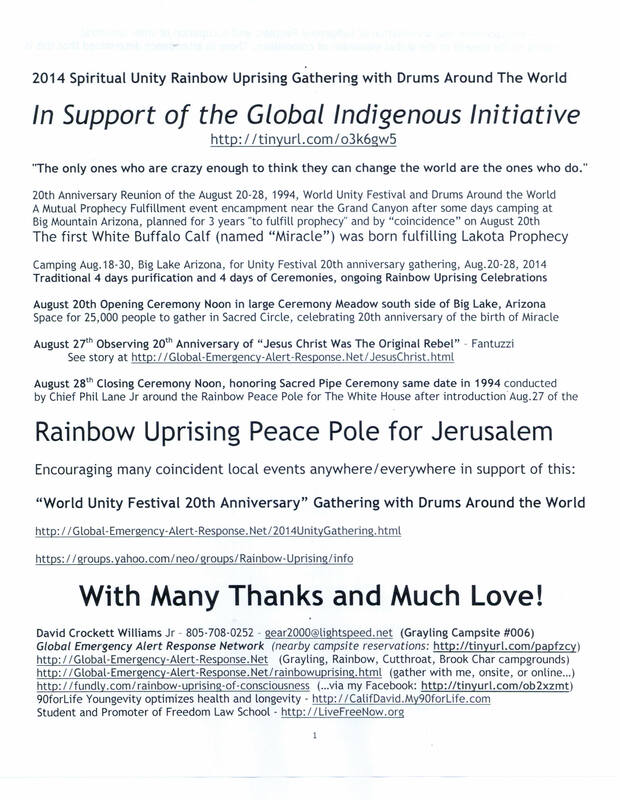 Got to Global Emergency Alert Response Network Homepage for 2014 Rainbow Uprising Campaign USA National Tour Schedule that includes this 20th Anniversary Event.